Email askfuiping@gmail.com to buy Lingzhi to protect your Liver. This article is put together from a seminar that highlighted various issues on Lingzhi and Liver, which in turn is taken from Ganoderma Bulletin Oct-Dec 2013 issue. This Bulletin is published in Taiwan every quarterly and updates readers on the contribution of Lingzhi / Ganoderma to our health. 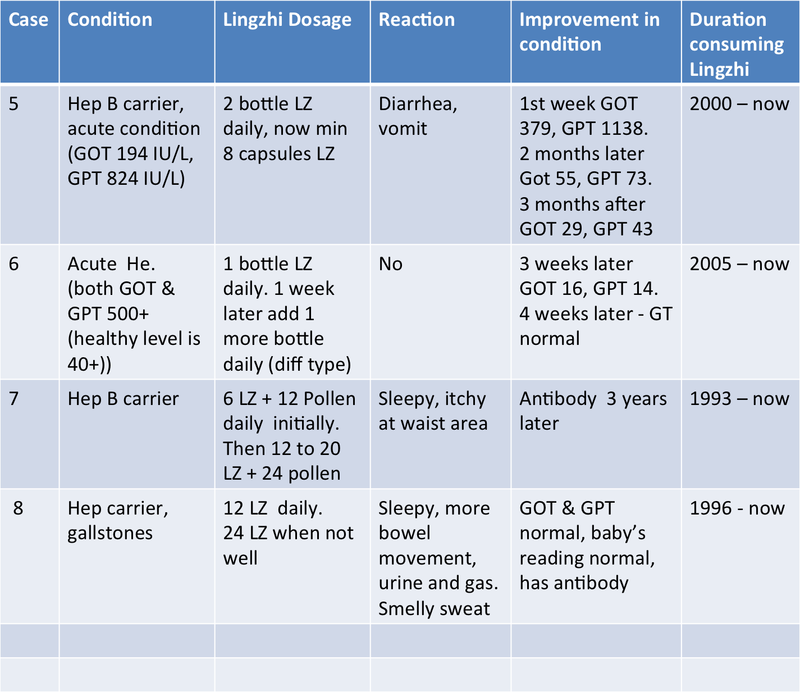 The research findings of 3 Professors with regards to Lingzhi's function in relation to protecting your liver are summarised below. 1. Reduce long-term consumption of alcohol and intake of self-prescribed medication. 2. Prevent over exposure to oxidation from free radicals as liver cells will die in massive quantity e.g. stay away from high-tension cables, switch off your handphones when you sleep etc. 3. Reduce consumption of food that is exposed to Benzo(a)pyrene, which is a by-product of incomplete combustion and burning of organic compounds from BBQ, cigarettes, gasoline etc. 4. 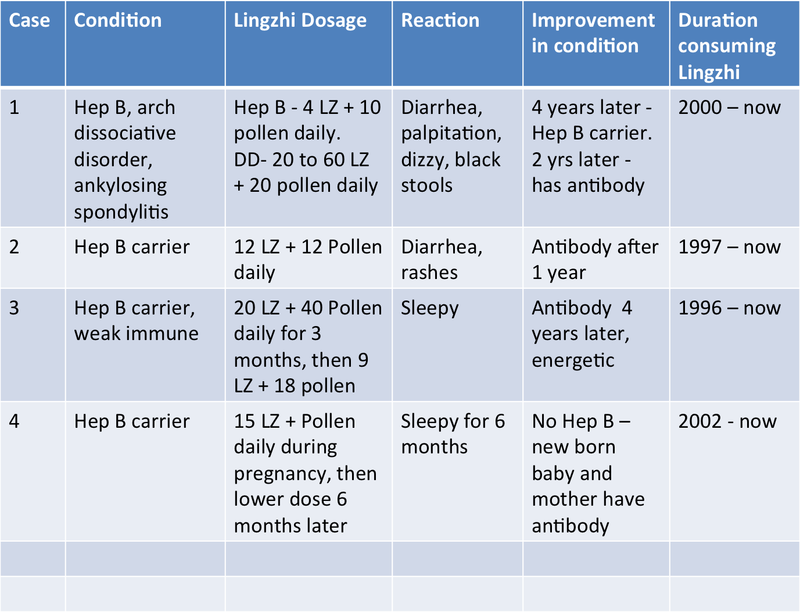 Prevent infection by Hepatitis B virus e.g. don't share the use of toothbrush, shaver and needles. Be careful when you go for vaccines or getting tattoos. 1. Lingzhi extract is extremely good in eliminating free radicals. 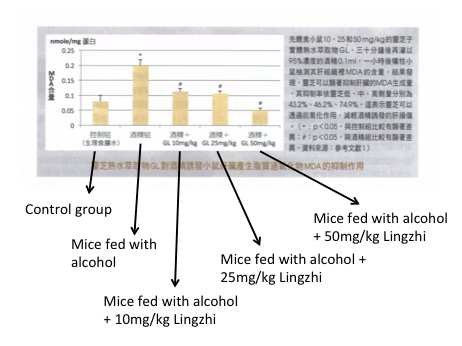 This diagram shows a lab test of mice fed with alcohol and various dosages of Lingzhi. 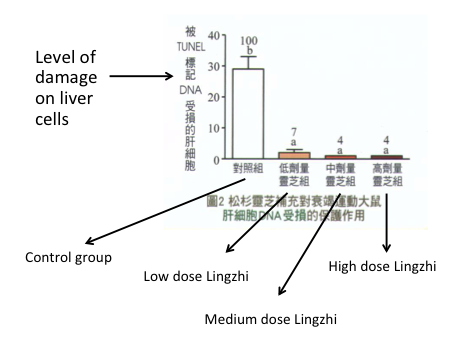 The findings show that mice fed with High Dosage Lingzhi extract demonstrate even better (lower) liver readings than mice that are not fed with Lingzhi. 2. 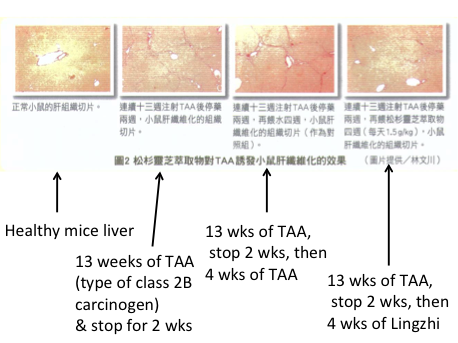 Polysaccharides and Triterpenoids prevent liver damage due to alcohol and viral infection. 3. 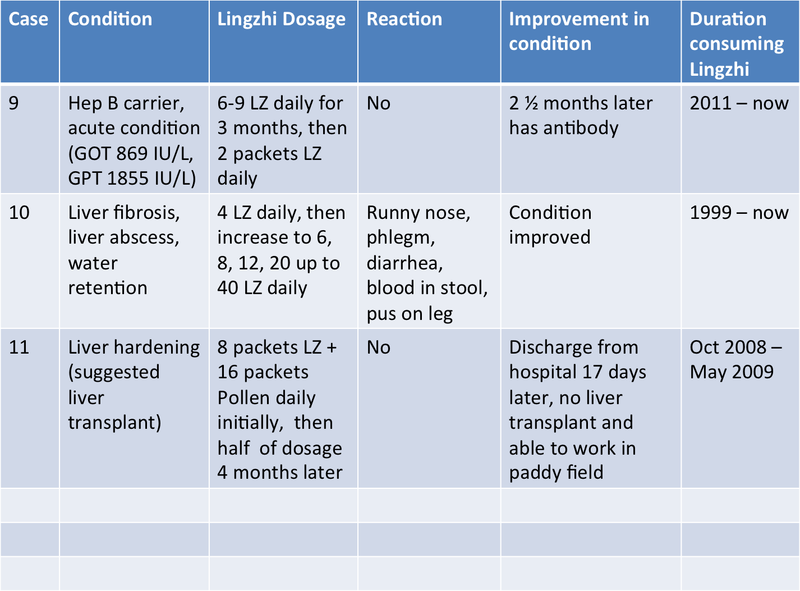 Lingzhi extract is effective in controlling mutation causing sources e.g. carcinogenic, chemical and toxic substances like benzo(a)pyrene, sodium azide, MNNG and NPD. 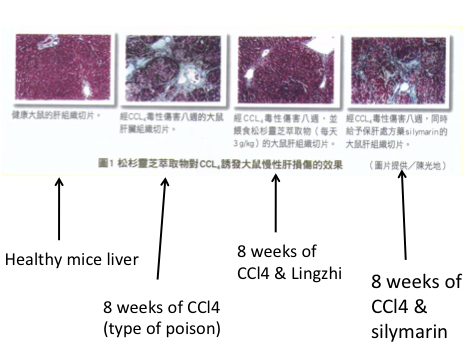 In other words, Lingzhi is very effective in treating such conditions which cause damage to your liver. 1. Has protective effect for liver injury due to immune condition e.g. in situations where your immune system attacks your liver. 3. Controls Hepatitis B virus from multiplication. The Hepatitis B virus hibernates in your liver cells. If your cells die, the virus may not die together, but instead move to other liver cells and continue to multiply, making it a long-term battle to control this disease. 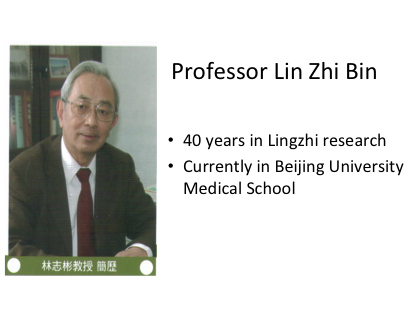 Prof Ling's findings show that Lingzhi as anti-oxidant effect, protect mitochondria DNA and prevent premature cells death. Lingzhi can reduce damage to liver caused by "exhaustive exercise". During periods of exhaustive exercise, your body's oxygen consumption is 10-20 times higher than during resting condition and amount of bloodflow through your muscles is 100-200 times higher. As such, the free radicals and peroxide level increase, thereby increasing the damage to your cells and affecting normal function of your organs. 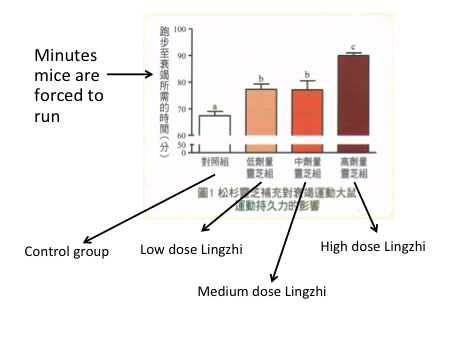 This diagram shows that mice fed with High Dosage Lingzhi have a significantly increased level of stamina, as they can run the longest duration. 3. 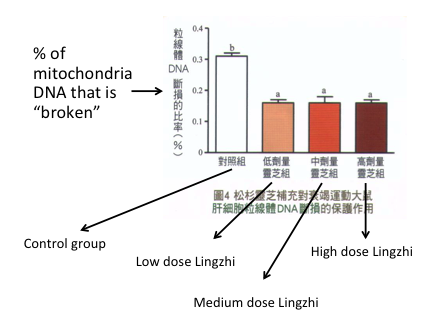 Lingzhi protects mitochondria DNA from being "disconnected" i.e. minimize the incidents of the DNA "connection" being "broken"
Exhaustive exercise creates massive oxidation, more injuries, drop in metabolism, poor bowel elimination and inflammation. 30 days before doing exhaustive exercise e.g. marathons, consuming Lingzhi can increase your anti-oxidant ability, protect your mitochondria DNA and avoid liver cells from dying prematurely. Moderate & consistent exercise results in better metabolism and antioxidant ability, compared to No exercise at all. A test is conducted on feeding mice for 8 weeks with carbon tetrachloride (CCl4 poison) - which mimics the effect of a hepatitis attack. 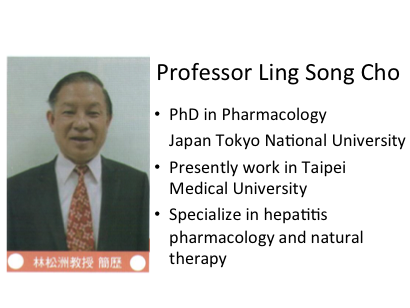 The findings show Lingzhi is more effective than silymarin in handling chronic hepatitis conditions. 1. Protecting liver cells from dying - lessen fibrosis condition. 2. Breaking down or dissolving fibrous tissues in liver - improve fibrosis condition. 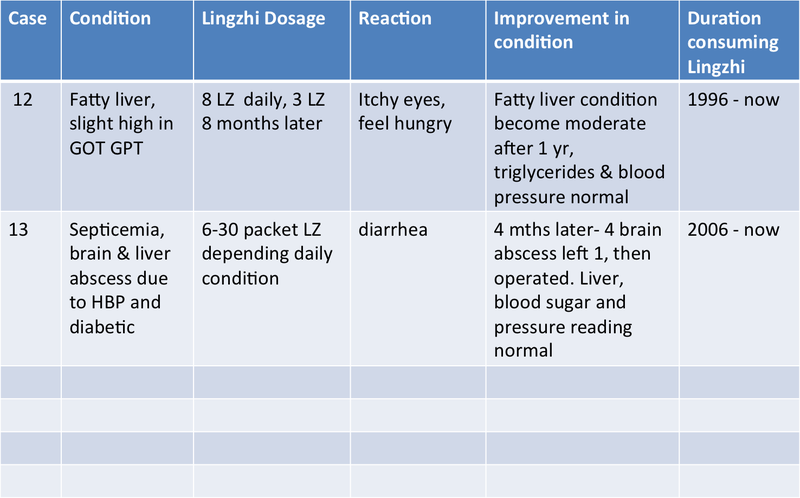 The Ganoderma Bulletin has also put together 13 cases of testimonies involving various liver related diseases, dosage consumed, improvement in condition and duration of consumption, as summarised below. 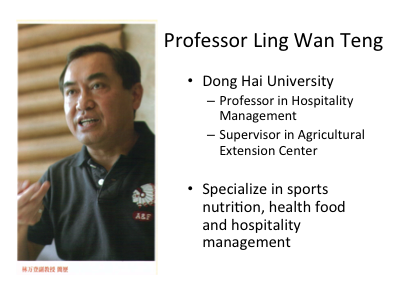 Please email me at askfuiping@gmail.com to buy Lingzhi to protect your Liver. Click here to refer to Shuang Hor company website for Product Description and Price.